Heads of state from 30 countries, including the Russian and South Korean presidents, will attend China's upcoming World War II commemorations, a Chinese foreign ministry official announced Tuesday. An insider told the Global Times that China has extended invitations to 51 countries, with only Japan and the Philippines declining. Experts believe that this attendance indicates the worldwide acknowledgment of China's long-ignored contribution to the Asian battlefield during World War II as well as China's rising global status. 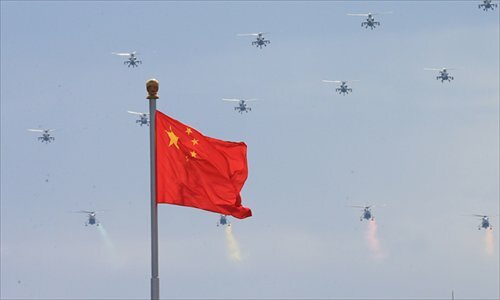 More than 10,000 troops - with contingents from 17 countries including Russia, Cuba and Egypt - will march in Tiananmen Square and along Chang'an Avenue in Beijing on September 3 in a parade to commemorate the 70th anniversary of the victory in the War of Resistance against Japanese Aggression (1937-45). Zhang Ming, vice minister of the Ministry of Foreign Affairs, said that attendees at the events will also include government representatives from 19 countries, such as French Foreign Minister Laurent Fabius, and heads of 10 international organizations, such as UN Secretary General Ban Ki-moon. Six former politicians, including former British prime minister Tony Blair, former German chancellor Gerhard Schroeder and former Japanese prime minister Tomiichi Murayama, will also attend. Analysts said that the attendance of Western government representatives would certainly "disappoint" Japan and its supporters. They believe it also showed that the Western countries are not as "united" as the media had portrayed when it comes to dealing with China. Choe Ryong-hae, a high-ranking North Korean official, will also be present at celebrations on September 3. Choe is a member of the Politburo Presidium and the secretary of the Central Committee of North Korea's Workers' Party. As World War II is widely considered to be more of a war within Europe, the participation of high-ranking officials from Europe could be interpreted as they have abandoned a Eurocentric view of that part of history and are recognizing the Asian theater, Wang Yiwei, director of the Institute of International Affairs at the Renmin University of China, told the Global Times. To commemorate efforts made in World War II, European countries always opted for May 8, generally known as the Victory in Europe Day which marks the formal Nazi surrender, and the D-Day landings of June 6, 1944, instead of August 15 — the Victory over Japan Day, Ji Qiufeng, a professor of international relations at Nanjing University, told the Global Times. However, on August 15 this year, Queen Elizabeth II attended commemorations in central London to mark the 70th anniversary of victory over Japan in World War II. Zhang added that dozens of foreigners acclaimed in China for their contributions during the Chinese People's War of Resistance against Japanese Aggression will join the celebrations, explaining that the group of over 100 foreign VIPs will include relatives of wartime heroes from 15 nations. Among them are veterans of the Flying Tigers, US pilots that fought alongside the Chinese during World War II, and Japanese veterans who served in the Eighth Route Army, a group army under the command of the Communist Party of China during the war. "More importantly, the large attendance shows the worldwide recognition of China's growing strength, as well as its legitimacy in building the world order," Ji said. Wang said that China has long been regarded as a challenger to the postwar world order created by victorious nations, but China's commemorations of victory in World War II will reassert its status as an order builder. He added that the participation of 49 countries also represents their acknowledgement of China's future efforts to maintain world order. Ji said their attendance aims to strive for more opportunities of cooperation with China, citing the China-led Asian Infrastructure Investment Bank as an example. "These countries held a pragmatic approach when they decided to attend the high-profile events, despite different political stances with China," Liu Weidong, an expert on US studies at the Chinese Academy of Social Sciences, told the Global Times.